Call 512.377.6961 for more information or to reserve tickets. 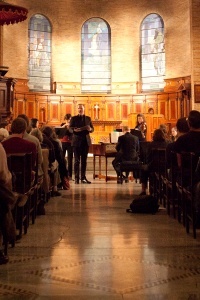 I performed in a wonderful concert last week at St Paul’s Chapel at Columbia University. I sang Scarlatti’s “Motet: Infirmata, Vulnerata” and Vivaldi’s “Stabat Mater”. The acoustics were amazing and I look forward to performing and recording these pieces again next spring. I’ll let you know when the dates are set! I’m thrilled to be performing in a recital of one of my favorite pieces, Vivaldi‘s “Stabat Mater“, with John Scott of St Thomas Church and the Sinfonia Players. The concert is to be held next Wednesday, October 13th, 7:30pm, at Saint Paul’s Chapel, Columbia University. It is open to the public and free of charge. Please join us and bring your friends — you’ll be in for a real treat! You are currently browsing the Ryland Angel blog archives for October, 2010.